Finding Quality Child Care can be a challenge. We are here to help you. The services of our Child Care Connection program offers a number of services outlined below that include individualized listings of programs based on parent preferences, financial assistance information, and help with identifying high quality programs. Click here for a checklist on quality care. Be sure to also visit our Look for the Stars site where you can get information on our 5 star rating system and current star levels for participating programs. Services for families are offered through the Early Learning Coalition’s Child Care Connection program. Child Care Connection helps children get ready to succeed in school and in life. We do that by promoting high quality early education programs and providing education and assistance to families. We also advocate for children, families and child care providers by providing a strong voice on behalf of children. The program provides financial assistance to income eligible families to access early childhood education. The program helps families to become financially self-sufficient and for their young children to be successful in school and in the future. Parents must be working or attending school minimum 20 hours a week, unless disabled. Parents must upload a document for proof of employment or their school activity. Florida’s FREE VPK program offers high quality learning opportunities for all four-year-old children. The parent must be a resident of Florida. Click here for many resources available to you, including Office of Early Learning Parent Pages newsletters. Individualized listings and referrals for quality child care based on parent’s specific needs such as location, type of program, or provider’s star level. Materials covering many areas of child development and behavior including the importance of early literacy. Assistance in locating community resources to support families and children. Parents are encouraged to arrange interviews and visits to several child care providers. 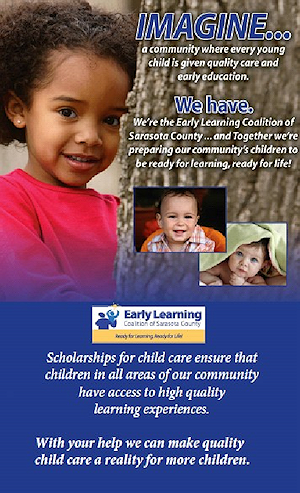 Click here for Sarasota Area Family Resources.